High-precision Fine Point: The stylus tip is made of 2.0 mm fine conductive plastic. This design gives a more real feel of writing, drawing and sketching. Stand-Alone Active Stylus Design: It does not need Bluetooth to work and it work on any App you are currently using. Super Power-Saving ：With built-in rechargeable battery, it is able to work continuously 20 hours and only charged 1-2 hours. The automatic stand-by modesaves a plenty of battery and makes the actual working time much longer. Compatibility: iPad tablet series, Samsung tablet series, iPhone series, Android phone etc. Note: Not match to Windows system and ipad air 2. 2.To avoid delay of response, please cloose idle Apps as much as possible. 3.We suggest use screen protector to prevent the screen from scratch by dust particles when use the pen. 4.The new product should be full charged for the first time. 【Sensitive and Smooth】This active stylus pen has a 2.0mm elastic copper tip gives you the accuracy you need and provides superior control and traction against tablet screens. In addition, the anti-fouling glove reduces the friction between your hand and the tablet surface, as well as making drawing more comfortable. 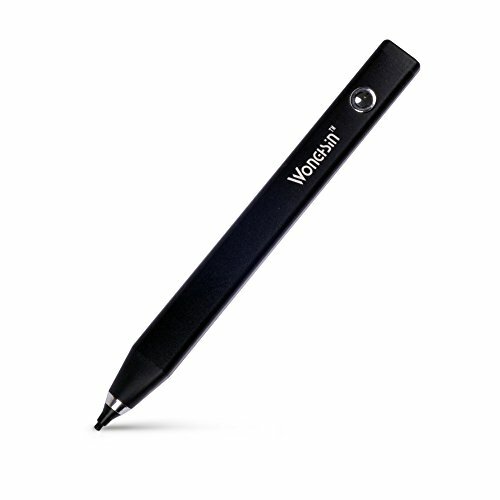 【Built-quality】The body of this touchscreen pen is made by Aluminum alloy that is durable for your daily use, and this stylus pencil is very sleek and comfortable when holding in hand. 【Rechargeable & Power-Saving】 The pen is able to work continuously for 20 hours after charging 1~2 hour. The automatic stand-by mode makes the actual working time much longer (the pen will be power cut automatically without any operation for 5 minutes).